Instead of waiting for a traffic light to turn green or a random thunderstorm to stop, getting beauty services at home lets your life go on without interruption. These are just some of the reasons to let the services come to you instead of going out to a spa or a salon. You can be busy planning a (or your) wedding, finishing up an assignment that’s due, don’t have the time to wait for the hair dye to set because you have a child that needs your attention or you simply just don’t feel like stepping out. For all these reasons and more, you can avail beauty services at your doorstep. HouseJoy gives you all the benefits that come along with having a beautician at home. You can schedule it as per your convenience and even get things done during your appointment. For example, you can watch your favourite show while hairdressers put in hair extensions or you can get a skin treatment done while keeping an eye on your toddler. Students with projects or exams might not have the time to travel to the salon and wait, but might still want their eyebrows groomed – the HouseJoy expert can do just that while you revise and get ready for your paper. Those who work from home or have deadlines to meet but also have a big party to get to can sit at their desk while the beautician takes care of hair and makeup. This way your work doesn’t suffer and you also look your best at the event. If you’ve planned a big holiday and left all the packing for last minute so you don’t have enough time to make your way to the salon – book everything you need (hair spa, waxing, threading, pedicure, manicure, facial and more) so you can concentrate on getting everything you need for your trip. Home services are ideal when you have a big event to go for and need services like facial, hair removal or even a mehndi design. Another reason why home services is a good idea – they make great gifts. Imagine you and mom getting pedicures at home together on Mother’s Day or gifting your workaholic sister a body massage service. It’s the best way to show appreciation to someone or just surprise them by making them feel special. After all, who doesn’t love a little pampering now and then? The next time you plan a girls day – invite everyone home and book a few beauty, hair and skin services for all and make a day of it. Certain services are best done at home – like applying mehndi to your hair, hair dye or facial hair removal if you’re the kind with sensitive skin. The beauty expert will bring special face hair removal wax so you can get the necessary skin care treatments before and after. If you’re looking for a beauty service in Bangalore, haircut in Bangalore or hair treatment service in Bangalore, there might be hundreds of salons to choose from, but you’ll have to make your way there through dust and traffic, only to have your face or hair get messed up on the way back home after the treatment. Now if you get the beautician at home in Bangalore, your hair and face will still look salon-fresh, hours after the treatment. If you’re looking for a massage in Bangalore, home service is the best way to go. The expert therapist comes fully prepared with a robe and a choice of oils, creams, etc. She even brings a sheet so your furniture doesn’t get ruined. You get to be comfortable in your own home, which makes the massage all the more relaxing. 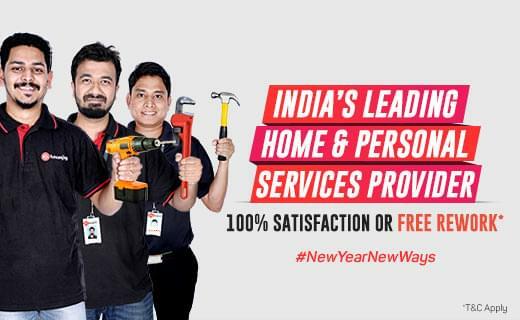 Instead of looking up random searches like ‘facial spa near me’ or ‘salons near me bangalore’ or ‘facials near me’, just book the service you need on HouseJoy and you’ll be connected to experts within your area who will come when you need them to. Asking around or visiting the closest salon might not be the best way to go as you may not get quality or quick service. Making a trip to the salon usually involves waiting for your turn among a crowd of customers. When you get the beautician to come home, you’re the only customer. That means you’ll have their full attention and they won’t be in a rush to serve the next customer in line. Getting efficient, great quality service was never this easy. Some services are more regular in nature – like threading, facial cleanser or waxing. Instead of making regular trips to the salon, you can get these services done every month, without leaving your home. If there’s a particular beautician who’s work you like, you can even give a rating or ask for her the next time around. All the beauticians are well trained and up-to-date with the latest trends and techniques. They come fully equipped with the necessary tools and materials to give you a great experience and amazing results. They also take complete care to see that everything is clean and hygienic for each customer. For all hair care services, the beautician will bring salon hair products so you look like you just stepped out of a salon. So the next time you want to book a beauty service and you’re not sure which salon to go to – just stay home and book a service online on HouseJoy.